Only the old-stock Ford Nationals remained at this year's edition of Ford Fest, but that didn't dampen the spirits of our intrepid correspondent. Folks, when Torontoist asked me to write about Ford Fest 2015, I gotta say, I was a bit surprised. Anyone who knows me knows that I’m a card-carrying #FordNation #Fordphile with a passionate interest in such issues as cars, taxes, and subways. Based on what I know about some of the folks at Torontoist … well, I think it’s pretty clear we don’t see eye to eye. Folks, I’m not a smooth-talking, fancy-word-using guy. I’m not gonna be able to debate these Torontoist folk with their so-called “expert opinions” that probably aren’t all that expert after all. What I do know is that I’m a regular guy like you, and folks: these politicians come up and tell you about their BS and this and that, and the fact is they’re as phony as a three-dollar bill. What I do know is that when you see Rob Ford, you see a guy who’s genuine. A guy who’s not like those tax-and-spend socialists down at City Hall. Talk is cheap, actions speak louder than words, judge him on his record, and the proof is in the pudding. But folks, despite my Fordian credentials, I’ll admit to feeling some trepidation on that bus to Islington and Rexdale. Almost one year after the last municipal election, when Rob graciously agreed to a “dual-mayor system” with political rival John Tory, would the fire of #FordNation be reduced to ash? Has the tax-and-spend socialism that has reigned since October 27 weakened our civic resolve? 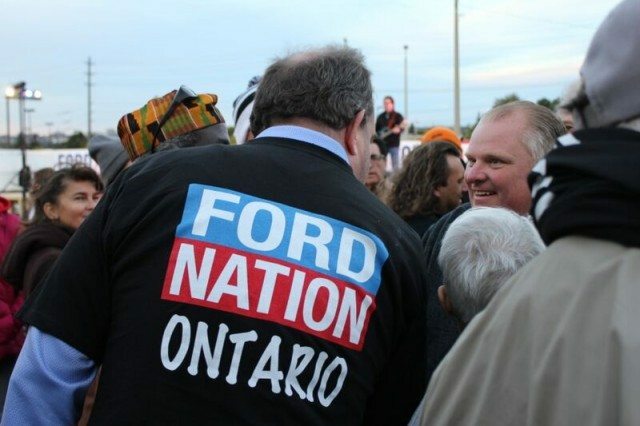 Folks, a lot of people are gonna tell you that this year’s Ford Fest was a disappointment: that it was too cold, that it was dark too early, that only around 500 folks stopped by for a burger, a T-shirt, and a selfie. But while crowds were smaller than in the glory days of 2014, we also lost the trend-hoppers, the protesters, and the Fairweather Fordians. What remained at Ford Fest 2015 were the true-blue, old-stock Ford Nationals. Folks, Ford Fest lived up to its usual standard of excellence. At the Ford Fest Stage, crowds enjoyed rockin’ musical favourites from local band Skip Tracer, including “I’m a Believer,” “Walkin’ on the Sun,” and “Is This Love.” For the little ones, there were four great rides, including a train station, a Berry-Go-Round, and more. There were burgers, bobbleheads, and even a tent where we could meet the former mayor Rob Ford himself. 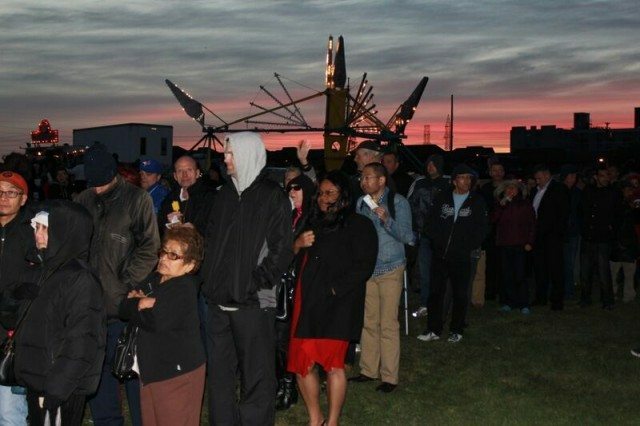 Folks, I look at the range of entertainment options at a simple community barbecue like Ford Fest, and then I look at the millions of taxpayer dollars spent on the waterfront, and folks, it brings a tear to my eye. Now folks, I’m not gonna pretend there weren’t some flaws—most surprisingly, a growing sense of politics as usual. Take the long line to get burger tickets: it stretched across the park, and was all too reminiscent of the bureaucracy that strangles City Hall (I tried calling Rob at his personal phone number so I could ask him to deliver me a hamburger in person, but I couldn’t get through). I was also highly disappointed to see campaign representatives from Conservative party candidates Toyin Dada (Etobicoke North) and Chuck Konkel (Scarborough-Guildwood). Though I consider myself passionate about such issues as politics, government, etc., these elites from the establishment parties had no place at this celebration of the common folk. I’m passionate about political issues such as transit and Ordinary Canadians, but we don’t go to Ford Fest for politicians. But folks, all my misgivings evaporated once the man of the hour took the stage. Rallying the #FordNation troops after a difficult year, Rob confirmed that his tumour was gone, his spirit was strong, and hinted strongly that in 2018, the dual-mayor system would end (a long overdue acknowledgement that showboating politician John Tory has unfairly overshadowed his partner). Though he would spend the night posing for photos and accepting praise, he said that Ford Fest was really for us: a token of gratitude from Etobicoke’s king to his subjects. 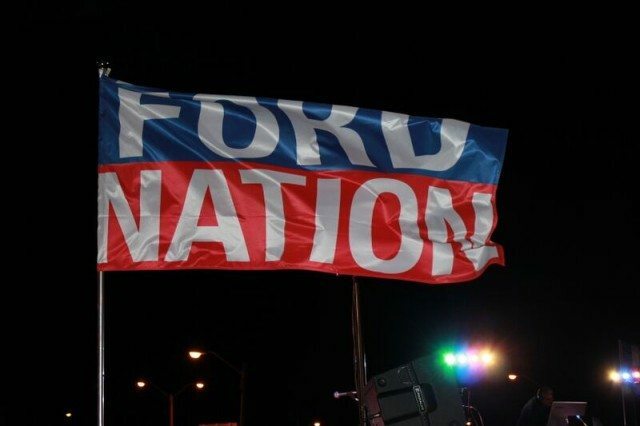 Though frigid darkness befell Ford Fest a little after 7 p.m., the sun will never set on #FordNation.